The Sampan Series of single, full range driver acoustic suspension and transmission line loudspeakers are some of the most accurate loudspeakers because they are true point source, perfectly time coherent, minimum phase, loudspeakers with no phase or driver integration problems. The Sampan Series is optimized for stereophonic listening. 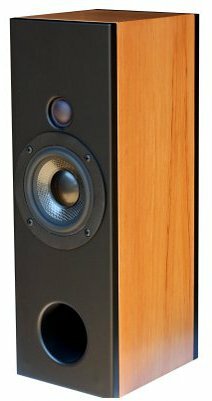 All loudspeakers in the series use high performance 3 transducers and a proprietary circuit to linearize and extend frequency response to 20,000 Hz. The Sampan DTL uses two transducers. However, the small size and proximity of the drivers allow them to operate as a time coherent point source over most of their operating range. Informed by the design of the Enterprise and the Sampan loudspeakers. Think of it as producing double the output of the amazing Sampan micro tower. "Few loudspeakers on the planet can create as much excitement as the tiny, unassuming Sampan..."
"The Greatest Disappearing Act Since Houdini "
"I even found myself ... questioning the performance of my Magnepans in several areas when compared to the Sampan FTL (in particular overall musicality, soundstage depth and micro detail). Consider it strong praise indeed for these little overachievers." "... the speakers sounded much bigger than they looked...vocals and acoustic guitar sounded full-bodied and robust." "Their midrange is scary good, seriously good in fact and unlike many full range drivers do not seem to be rolled off in the top end as one would expect." The Skiff Armada System will outclass most minimonitor subwoofer systems and even some highly regard monitor-pedestal bass systems. The Sampan Soundbar is a hybrid dual folded transmission line and acoustic suspension loudspeaker design that combines the design of the Sampan and the Skiff in one cabinet. The Sampan Music Box is an amplified stereo speaker system that is inspired by our critically acclaimed Sampan, employing 3 inch full range drivers in two folded transmission lines. It features a built in 200 watt amplifier (100 watt per channel).